*UPDATE: K9 has now been sold! What about lights and sound? 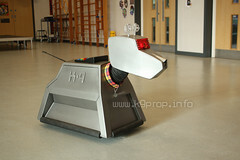 It's a full size replica of K9 the Robot Dog from Doctor Who and Sarah Jane Adventures from the BBC. It's very well researched and superbly detailed and accurate. It's of exhibition quality and would make a Doctor Who fan very happy indeed! It's moulded in GRP (fiberglass and resin) in the same way as the original BBC prop. It's contruction is far superior to any wooden version (or a sheet plastic version, glued and filled at the corners!) Additional detail parts are made in cast resin, aluminium, steel and rubber. The inner base is made of plywood to allow easy fixing of additional inner workings. The prop runs on 4 castors. It has articulated neck, ears, nose gun, and tail. It is not motorized in anyway, although when it was made it was intended that it would eventually be fully remote controlled and motorized. So, it is currently a static prop, but with and opening side panel and opening head, there is full access for the new owner to upgrade the prop. K9's eye's light up with 2 standard torch bulbs and are switchable via a battery pack inside the body. His control panel also lights up with the two larger red panels having static illumination and the 'buttons' flashing on and off in sequence as per the original prop. The control panel takes a seperate 9v battery and is lit with ultra bright LEDs. K9 currently has no sound effects fitted. I'm a life long Doctor Who fan. I have lots of experience in casting, moulding, carpentry, sculpture, welding, mechanics and vehicle restoration (oh, and a little bit of electronics), all of which played a part in K9's creation. I began researching and building formers for this K9 about 10 years ago. In 2006 I travelled down to Cardiff and was able to check my measurements against a BBC prop ensuring accuracy in it's dimentions. I built him for me (not with the intention of selling), but next year I'm starting work on a Police Box replica, so my hobby needs funding! UPDATE: K9 has now been sold and lives with new owners!